This neat little low angle plane is 225mm long, 59mm wide and weighs only 1.25kg. It is easier to handle than a full size smoother. 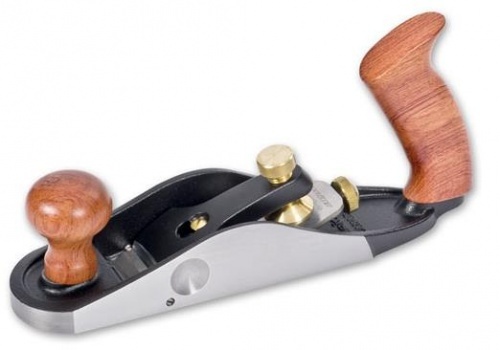 Think of it lying somewhere between a large block plane and a full size smoother, then you’ll see just how useful this plane can be. Like a full size version, it is useful for final finishing of surfaces, end-grain work and for shooting mitres. The ductile cast iron body is fully stress-relieved, machined and surface ground with a bedding angle of 12° . The supplied 44mm wide blade has bevel of 25°. The locking front knob controls the adjustable mouth,an adjustable stop-screw in the throat lets you open the mouth fully for blade removal (for honing) and replacement, yet quickly restores your chosen mouth setting. The large wooden front knob and rear handle provide both comfort and excellent control. The Norris-style adjustment mechanism, with its combined feed and lateral adjustment knob, makes blade setting easy and accurate. Set screws prevent the blade from shifting, but allow full lateral adjustment. The lapped blades have a flatness tolerance of ±0.005mm or better over the working surface, and with an average roughness surface finish of 0.000127mm or better.